‘Our collection of plants was now grown so immensely large that it was necessary that some extraordinary care should be taken of them, lest they should spoil in the books. I therefore devoted this day to that business and carried ashore all the drying paper, nearly 200 quires, …spreading them upon a sail in the sun, …often turning them, …By this means they came on board at night in very good condition.’ So Banks wrote at Botany Bay, just after he left New Zealand. Presumably Professor Geoff Baylis had less quantity to deal with, but the exacting process of keeping botanical specimens was no doubt similar. Baylis collected this sample of Cook’s ‘scurvy grass’ (Lepidium oleraceum) in Dunedin in December 1951. Because of its antiscorbutic properties, Cook also used it to ward off scurvy. 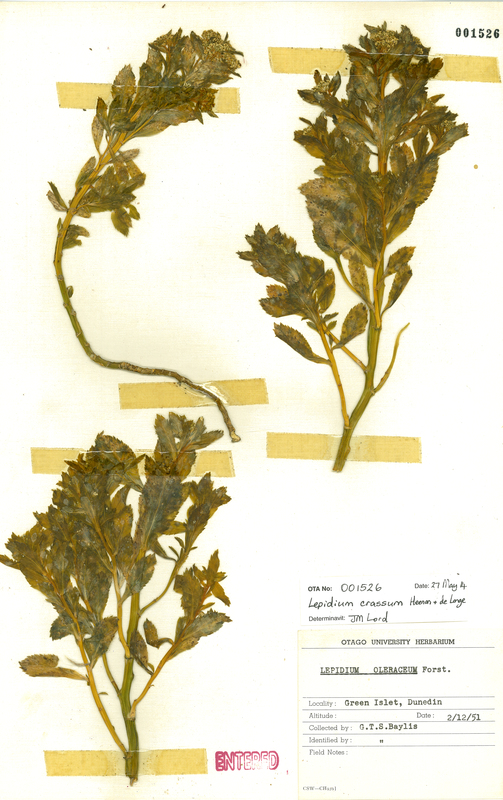 Professor Geoff Baylis, “Lepidium oleraceum [Cook’s scurvy grass],” ourheritage.ac.nz | OUR Heritage, accessed April 26, 2019, http://ourheritage.ac.nz/items/show/8688.